"Why is it always ladders?" Series 11 of Doctor Who, starring Jodie Whittaker as the 13th incarnation of the Time Lord known as the Doctor (a phrase I’m never gonna get tired of), still looks abso-pluperfectly amazing in the second episode. Bless those lenses. Remember when Doctor Who went to Dubai and accidentally wrecked a bus to film in the desert where Michelle Ryan and Daniel Kaluuya pretended to be on a different planet but it was basically just flat gold sand and flat blue sky so you might as well have let David Tennant stay home and get shouty in front of a green screen? 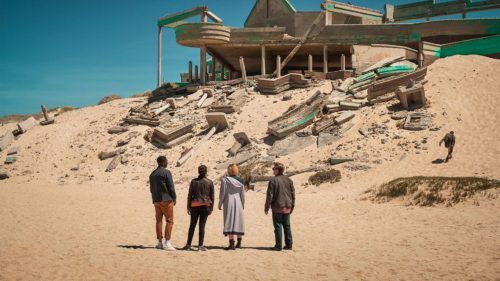 That does not happen in “The Ghost Monument.” They went to South Africa for this one and new director Mark Tonderai doesn’t waste a frame. Even if it’s not quite an alien planet, it’s definitely not CGI or Wales. Sunlight flows over the exterior shots like warm honey. On the close ups, that light lets us see so much more of the characters’ emotions; we almost fall into the actors’ faces – in a good way, not a Fantastic Voyage mishap. The sets and interior shots don’t slouch about, either. When she says, “This is lavish, for a tent,” I’m thinking, “Yeah, Doctor, this is lavish for your show. And it’s in a tent.” The CGI even has a different flavor now, a sort of crispness and sparkle that we haven’t seen before. When the Doctor’s hand swipes through the hologram, the effect feels like a program with a different budget, you know? An American budget. You can feel the new hands at the wheel. In our epistolary chats about Doctor Who, I’m trying to steer clear of spoiler-leaning content. Not because I think you haven’t seen the episode yet, even though you are a busy person. No, it’s just that there might be someone standing right behind you, mightn’t there? That person could be reading over your shoulder, and they might not have seen the episode, so I keep mum about plots and twists. It’s the romantic in me. So leaving aside the Jaw Dropping Thing, but speaking of plots and twists: as I said to another friend, the stories of Series 11 (so far) seem to be a little simpler, more straightforward, more recognizably family adventure TV. It’s Doctor Who storytelling streamlined, stripped back to basic principles. Doctor Who is always about change and loss and questions, but it’s also always about an eternal heroine, and family, and science facts. This yahoo on Twitter thinks it’s 1963 all over again. It’s not a bad choice to make in 2018, and it’s certainly inviting to new viewers, younger viewers, casual viewers, and people who like nice TV. In fact, I might go as far as to say this is Doctor Who made for people who actually want to enjoy themselves while watching the show. It looks great, it sounds great, and it’s not putting you through the wringer emotionally or temporally. It’s got fun characters with recognizable lives and problems. That said, Yaz does get the short end of the development stick this week while the Ryan/Graham fault line gently builds tension. And what of the Doctor? She’s streamlined, too. She simply and uncomplicatedly knows herself to be “the Doctor.” She does what’s right and helps where she can, going forward in all her beliefs. She values what we know deep-down is best about the Doctor. She’s not driven by angst or guilt or omnipotence or self-doubt, yet neither is she a super-hero nor saint. 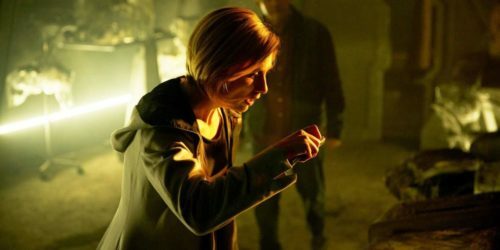 She’s so far a Doctor who is brilliant, but can worry, and be uncertain, even as the quips and confidence shine out of her. And when she doubts, she has her new friends. Which is perfect. That’s what friends do. They assure us that we are capable of our best. They trust us to do what we said we would. Our friends remind us who we are, and who we can be. Doctor Who is in good hands. Their hearts are in the right places. Can’t wait until next Sunday. P.S. Do you do ratings on the Planet of Fanboys? If I had to, I’d give this Seven Spooky Eel Blankets out of a possible Pitch Black Remake.